Australian Disc Golf are proud to announce the team for the 2019 World Flying Disc Federation World Teams Disc Golf Championships. This event will be held in Alutaguse, Ida-Virumaa, Estonia this August 21 to 24. We are pleased to announce, along with Gail Lynch, the induction of Tim Marchbank into the ADG hall of fame in 2018. Tim started his life with frisbees at the University of Queensland in 1994. 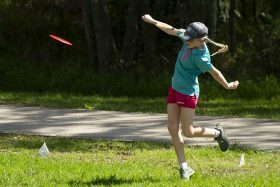 A former champion orienteering competitor, he started playing ultimate and object disc golf before acquiring his first golf discs when John Bray park was installed. Ultimate remained his main focus for the next 10 years though; and he represented Queensland in that sport a number of times. 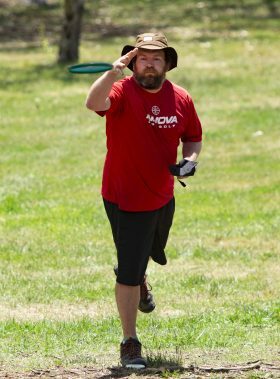 In 2003 he traveled to Canberra for the Australian Ultimate and Flying Disc Championships and it was at this point that he began the transition to disc golf. Tim was involved in the early development of the ADG as it grew its independence from AFDA. He has served on the ADG board for many years along with his involvement in the administration of Ultimate in Queensland. As a player his list of achievements is extensive: He won the Australian championships in 2004 and 2009, has won the QLD championships five times and finished 2nd three times. He won the ADG tour in 2007 and even has an international win – the Crater Cup in New Zealand in 2005. He helped design and install the Fehlberg Park Course in Brisbane in 2007. Tim has also coached at numerous come and try days, Brisbane City Council’s Active & Healthy Parks Program, Moreton Bay Regional (& forerunner Pine Rivers Shire) Council’s school’s programs and others. Tim’s also an accomplished photographer and one of his disc golf pictures have featured on the cover of Disc Golfer magazine. ‘Rowdy’ as a few people call him, is the definition of a quiet achiever. His humble manner, high intelligence and clear vision for the sport will stand out to anyone who takes the time to get to know him. FPO is now a mandated division and must be offered at all ADG tour events. For ADG tour only, FA1 and FPO points will be combined. MPM is now a mandated division for Australian A-Tier events only. It’s not mandated for B-Tier and below but may be offered if there is demand. For the ADG tour only, MPM points will be combined with MPO. Masters players take note MPM will be offered at the ADGC in Canberra this year.